As a companion to my pixelPi software and I've started work on an output device which works with OLA (Open Lighting Architecture). 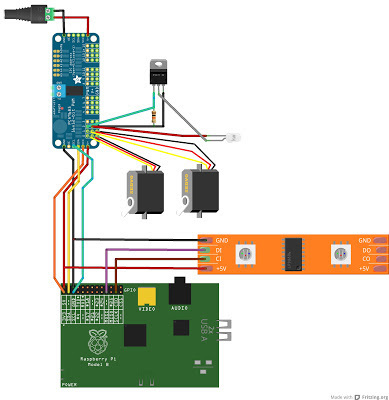 This allows the Raspberry Pi to be use to control; servos; dimmers; relays and pixels (via pixelPi) all controlled over standardized lighting/prop control protocols supported by OLA. This would essentially be a configurable node which drives hardware and can be controlled with Artnet; E1.31; ESP Net; Pathport; Sandnet; Shownet. An awesome pixel array running PixelPi! - Run it like this: " sudo python pixelpi.py --chip WS2801 --mode all_off "
- The PixelPi software receives the packet and sets the pixels accordingly. - panning on large images across the pixel array. Ideally I was thinking it would be cool to pass in some images from vgamaps.com and have it pan around them.